Do you need to have a document notarized? We offer accurate and dependable service for all your needs! Convenient: No appointment needed! Our notaries are available Monday-Friday 10:00 AM-5:00 PM and on Saturdays 10:00 AM-2:30PM. Walk-ins are welcome! Reliable: We are a member of the National Notary Association and our notaries are commissioned and insured. Just bring your unsigned documents into our store for Notarization. Please feel free to call in advance if you have any questions: (559) 297-9005. We are conveniently located on Shaw Avenue across the street from the Sierra Vista Mall in Clovis, CA (click to find our store). Understand your document and what type of notarization you require. The most common ones are acknowledgments or jurats (sworn statements). In addition to your unsigned document, you will need to bring a current valid ID such as a current driver’s license or U.S. passport. If you have any questions regarding valid ID, please call us in advance. Can you provide legal advice? No. A notary is forbidden from preparing legal documents or acting as a legal advisor unless he or she is also a licensed attorney. 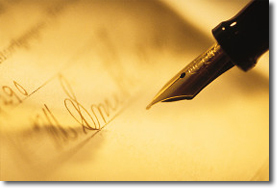 A notary cannot answer legal questions or provide advice about your particular document.